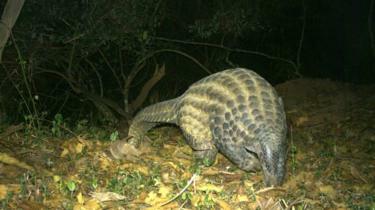 The secret life of the world’s most trafficked mammal, the pangolin, has been caught on camera in Africa. 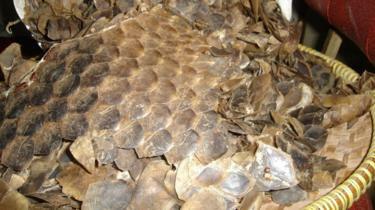 Footage gives a rare insight into the behaviour of the giant pangolin, the largest of all the scaly animals. Observed by remote-operated cameras, a baby takes a ride on its mother’s back, while an adult climbs a tree. Scientists are releasing the footage to highlight the plight of the animals, which are being pushed to extinction by illegal hunting for scales and meat. Large numbers of their scales have been seized this month alone, including Malaysia’s biggest-ever interception of smuggled pangolin products. The images and video clips of giant pangolins, one of four species in Africa, were taken at Uganda’s Ziwa sanctuary, where the animals live alongside protected rhinos and are safe from poaching. Stuart Nixon of Chester Zoo’s Africa Field Programme said much of their behaviour has never been recorded before. “We know so little about this species, almost everything we’re picking up on camera traps this year as a behaviour is a new thing,” he told BBC News. The giant pangolin, found in the rainforests and grasslands of equatorial Africa, is the biggest, measuring up to 1.8m long and weighing up to 75lbs. Its scales are in high demand in Asia for use in traditional Chinese medicine, despite there being no medical benefit for their use, while its meat is considered a delicacy in some countries. This week, authorities in Malaysia seized more than 27 tonnes of pangolins and their scales – believed to be worth at least £1.6m – on Borneo, in the biggest such haul in the country. 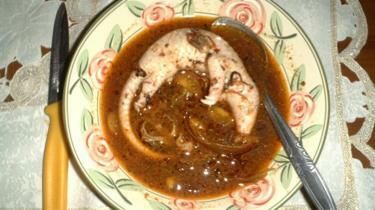 The wildlife monitoring group Traffic said police had discovered two big pangolin-processing facilities stocked with thousands of boxes of meat in the eastern state of Sabah. “It is hoped that comprehensive investigations can lead to unmasking the syndicate and networks operating from the state and beyond,” said Kanitha Krishnasamy, Traffic’s director in Southeast Asia. The discovery comes just days after 10 tonnes of scales were intercepted in Vietnam, Hong Kong and Uganda. Scientists say the plight of the animals looks bleak, and they have no idea how many are left in the wild. Stuart Nixon, who is working in collaboration with the Uganda Wildlife Authority and the Rhino Fund Uganda on the project, said they are encountered so rarely in the wild that there is not enough data to allow a decent estimate. A study is under way to survey and monitor giant pangolins at the site as the first step towards identifying their strongholds.